Hi everyone. I wonder if it is possible to remove the first (left) and the last (right) arrows on the carousel, so that the user can clearly understand when the carousel starts and finishes. Also, I wonder if there is a way to make the carousel not change image automatically. Could you increase the transition to a really long time - this would effectively be the same thing. Doesn’t a carousel imply that it goes around and around - with no obvious end? Have you tried lightbox instead it may do what you require. Thank You Ant3000, that’s exactly what I explained to my client, but he prefers a manual control. I’ll try the lightbox then. The slower shifting time on the carousel could also be interesting, but how can I implement it? I don’t recall any settings for that. Transition time is as easy as adding “data-interval=“#-in-milliseconds”” property to the carousel portion of the code Blocs exports. 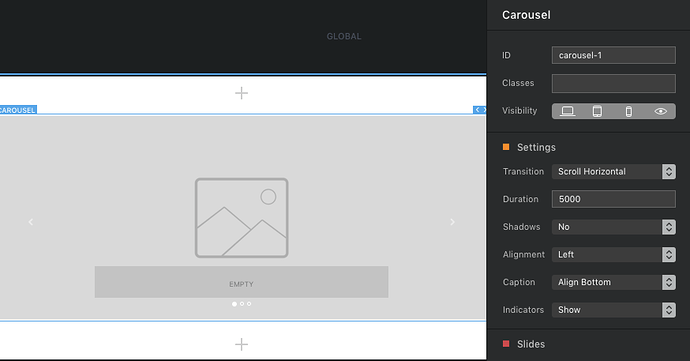 It was however added in Blocs 2.3 Beta, as Duration under Settings for the carousel. Understand however that 2.3 is not backwards compatible, so make a copy of your project if you are gonna switch to it for that feature or others. As far as looping vs not looping the carousel, I don’t think that is directly exposed in Blocs to the users, but would be a another good candidate for the Settings of the carousel perhaps. Thanks, I’ll give a go then. I’m already running the beta, but I did not find the duration setting: I’ll download the one liked by You. Worst case I suppose I’ll resort to lightbox or the first solution you gave me. Thanks again!